EASY TO MAKE recipe for Homemade Shredded Chicken Dumpling Soup with potatoes, carrots and celery. This creamy soup is a healthy comfort dinner food! Best served with biscuits to dip into the chicken broth! Mom, your families are going to love this! 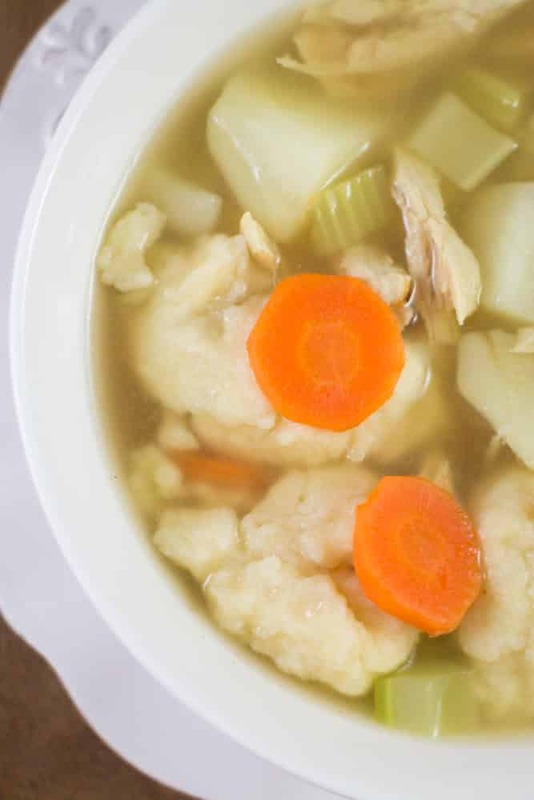 This Homemade Chicken Dumpling Soup is a Winter comfort food favorite. 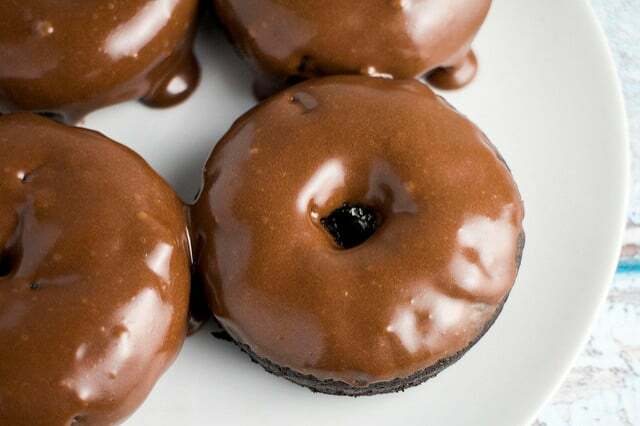 It’s so delicious that I can almost guarantee that whenever I make it, we’ll have it the night after again because the craving will still be there. That’s what happened last week. I made it on Wednesday, we ate it all, we loved it. On Thursday we decided we were going to make it for dinner again. And we ate it all again. 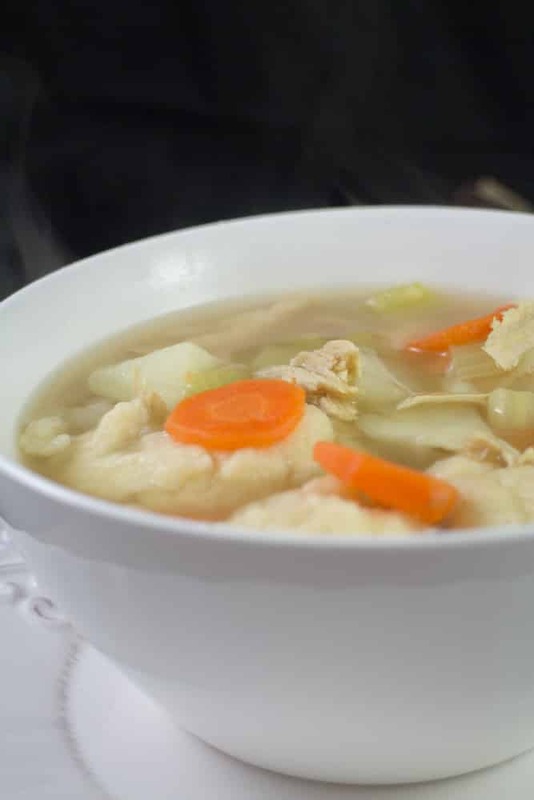 The Best Things About Chicken Dumpling Soup! 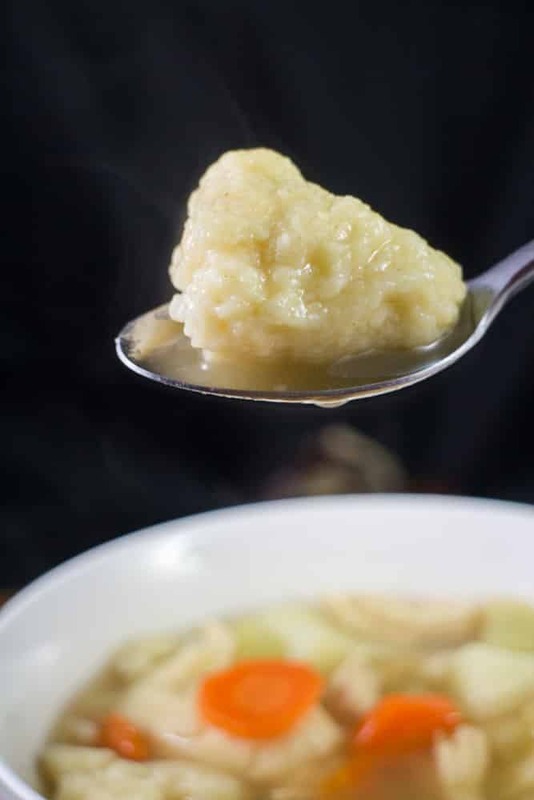 The best thing about this chicken and dumpling soup besides the homemade dumplings (yum!) 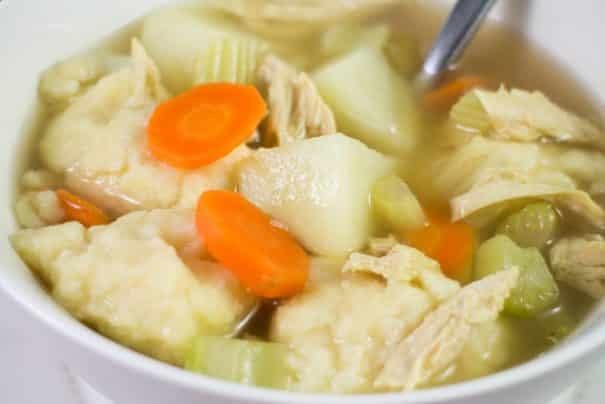 is that it’s also filled with veggies – potatoes, celery, carrots – everything a good chicken soup should have in it. Can I substitute or add additional vegetables? Feel fee to make it your own and add additional vegetables if you’re trying to empty out the fridge – onions, peas, green beans, and bite size cauliflower are all equally good in it. Just don’t skip on the potatoes – never skip on the potatoes! Can I use chicken bouillon cubes instead of broth? You sure can. Use vegetable broth instead of chicken broth and don’t add in chicken breast. You might want to add in some additional protein like white or great northern beans. Are dumplings hard to make? No. Homemade dumplings are one of the easiest things to make. It’s really just about mixing some simple ingredients together and then dropping it into hot broth to form the dumpling. The dumplings might not be the prettiest you’ve ever seen, but they will taste just as delicious. Do I need to make a side dish for this soup? I never do, it’s pretty hearty as is. I like to serve with some buttered bread or rolls. How good is this soup? So good you’ll make it again tomorrow.